The Travelling Lindfields: Q Station Manly: A unique place in Sydney's history. Christina, my great great aunt, died of measles during the voyage and was buried at sea. She was one of twenty on board who fell ill with the disease. "Just before dinner our dear little Christina died this afternoon after a very short illness at 5.15 as if she was going to sleep .... her time had come and she had to go where we trust she is better off." With measles, a contagious and sometimes fatal disease, on board the Orontes passengers were required to disembark at Sydney's quarantine station and to remain there until they were cleared of any risk that they might pass the disease on. "A most lovely morning but we are a little down as we have got orders for all married people to go into quarantine ... the single men and women had to keep on the ship .... the quarantine buildings is (sic) about a mile from the ship and when there has been a very deal off (sic) illness on board of any kind they have got to go into these buildings until the doctors & commissioners pass the ship." In the event, my forebears were lucky. They remained at the quarantine station for only a few days before being able to begin their new lives in Australia. 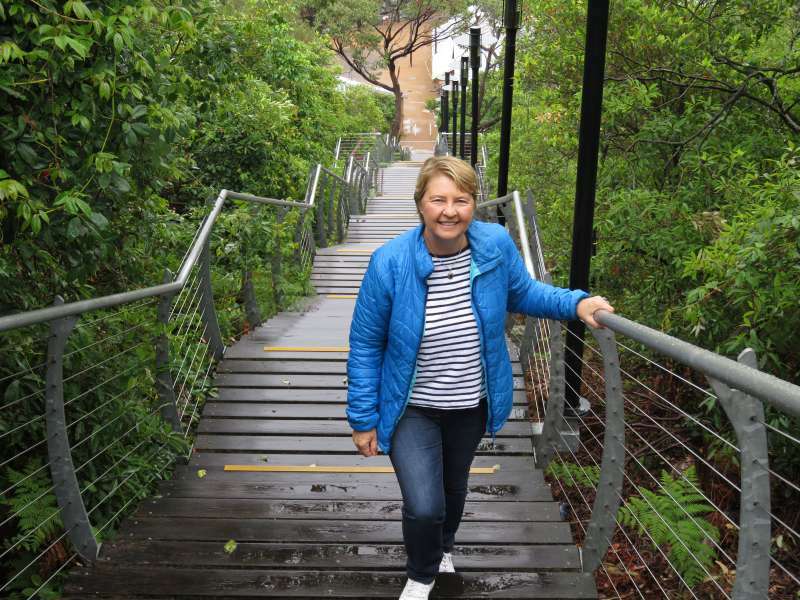 Recently David and I were able to explore my family's past with an overnight stay at Q Station, Manly. Me, climbing the giant stairway at Q Station. If it looks familiar, we were told that these stairs have featured in 'The Biggest Loser' from time to time. I wonder if my ancestors climbed this hill? Between the 1830s and 1984 every migrant ship entering Sydney Harbour was required to be cleared of infectious diseases before the passengers were able to land. 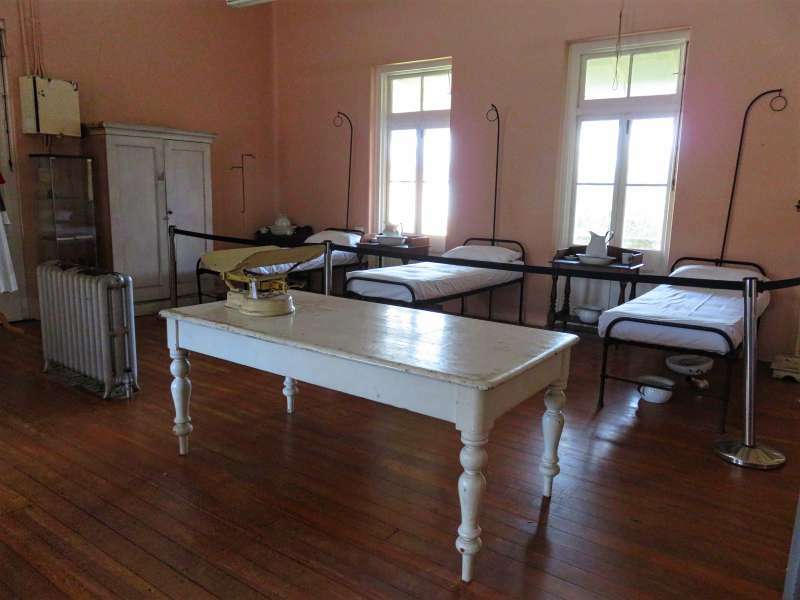 If disease was suspected on board both the sick and the healthy were sent to the quarantine station. Some, like my forebears, spent only a few days there, some spent many months and others, more than 500 in all, died. They died of terrible diseases, the mere names of which conjure up images of suffering and desolation - diseases such as smallpox, bubonic plague, typhus and Spanish flu. The healthy were segregated from the sick which meant that those who died often did so alone without the comfort of family or friends. 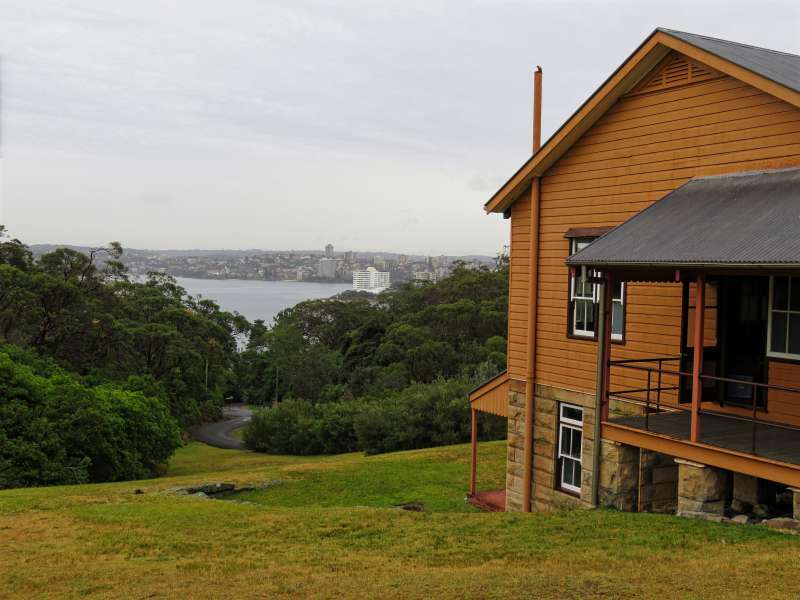 Today the buildings and grounds of the quarantine station have been repurposed as Q Station - a modern hotel and function centre. The dull day didn't improve my photographic skills but you can get an idea from this photo of the view we were treated to in the grounds of Q Station. 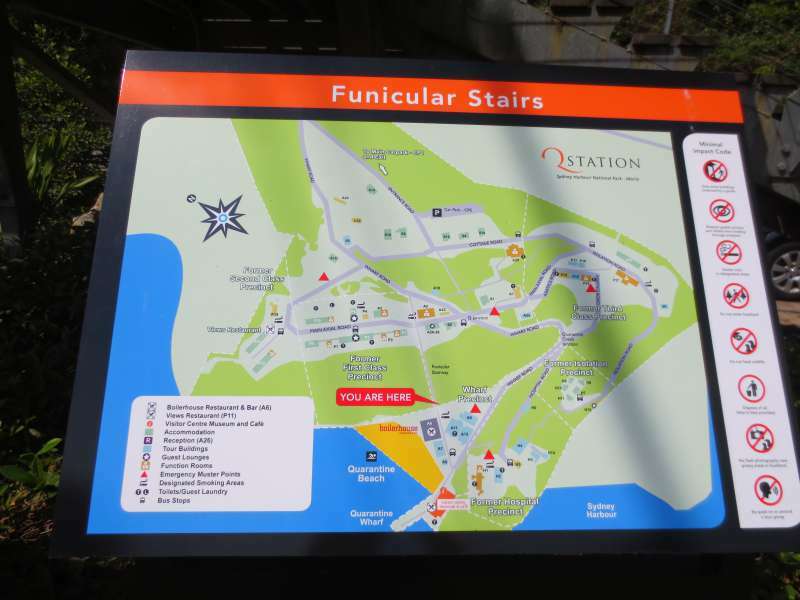 Q Station is located within the 30 hectare grounds of Sydney Harbour National Park at North Head near Manly. 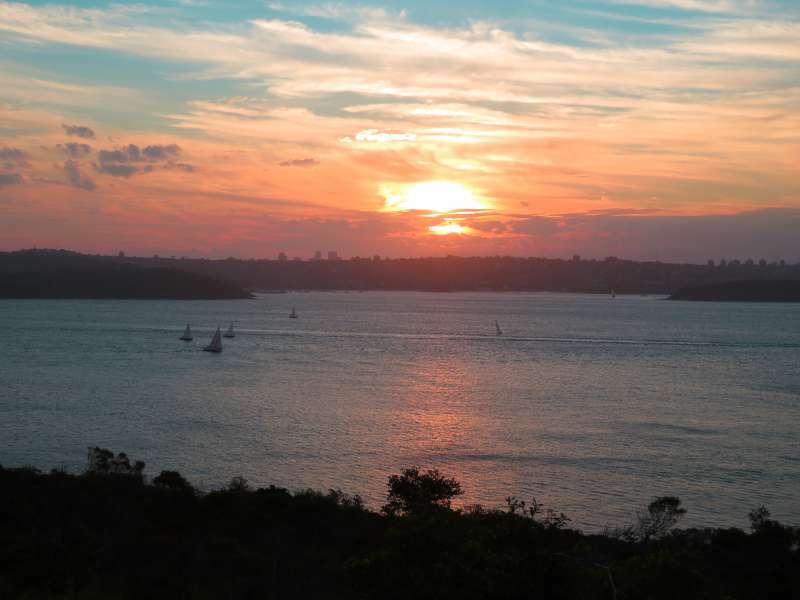 North Head has uninterrupted views across Sydney Harbour, perfect for early morning or evening strolls. The grounds of the hotel are so extensive that shuttle buses take you from reception to your room. This map gives you an idea of how extensive the grounds of Q Station are. 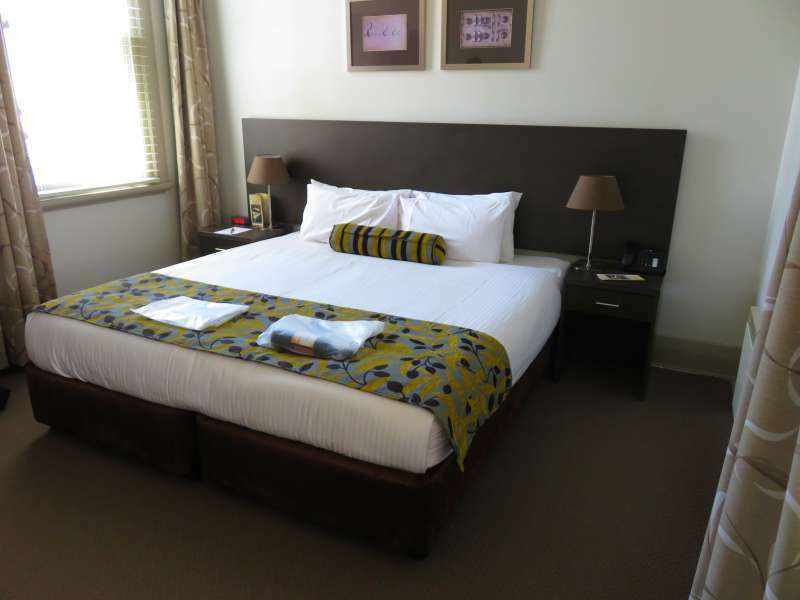 Guests are accommodated in heritage listed buildings which were once home to patients and other residents. We stayed in a suite in the former Isolation Precinct. With its separate living room and crisp white linen it was pleasant and comfortable. The bedroom of our suite in the Isolation Precinct. The downside to repurposing heritage buildings is that management is restricted in the changes it can make. A modern architect would no doubt have positioned the Isolation Precinct rooms to take greater advantage of views of the harbour, but perhaps Q Station's original inhabitants had looked at enough water by the time they arrived. Our room looked out onto nothing more grandiose than native Australian bush. Fortunately a nearby lounge area and its outside deck gave us a great vantage point from which to sip cocktails and admire the harbour. Part of the Hospital Precinct. Soon after we arrived we were ushered onto a history tour. Even if history is not your thing I defy anyone to be uninterested in the stories of the day to day lives of those who passed through the station. Imagine surviving months at sea and coming half-way across the world, only to be incarcerated for an indefinite period in quarantine. Emigrants disembarked their ships at the quarantine station's own wharf. From there they were sent to decontamination showers to scrub down with a burning mixture of carbolic soap and water. The precious few possessions they had were sterilised with high pressure steam in huge autoclaves. Imagine what that might do to your family heirlooms. While the sick were housed in the hospital precinct, the healthy were confined with their fellow passengers for the duration of the quarantine period for whatever disease they were suspected of carrying. If a single member of a group fell ill, the whole quarantine period would begin again. 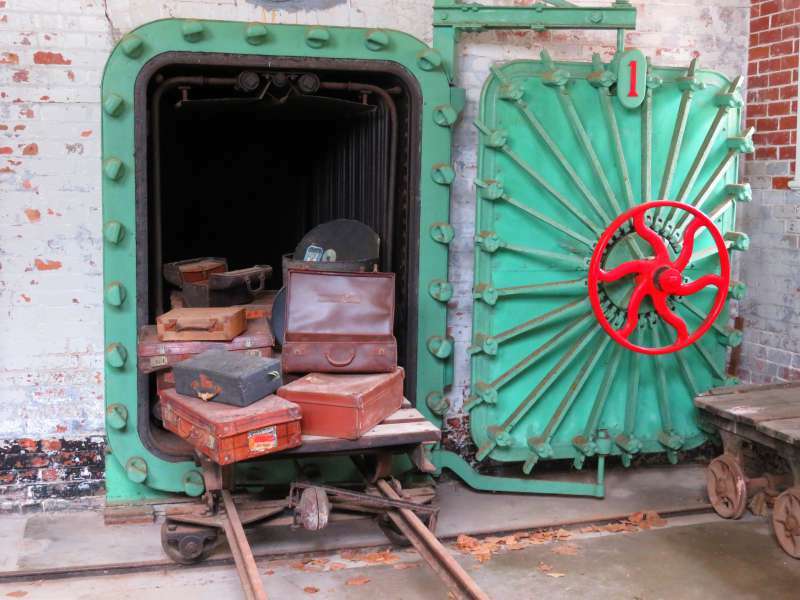 Luggage was sterilised in huge autoclaves. Q Station has a reputation as the most haunted place in Sydney. After experiencing a Q Station ghost tour I can see why. Click here to read about my encounter with a Q Station ghost. Some of our tour group felt a 'presence' in the old hospital ward. The bad weather jinx which has been following David and I around for the past few weeks struck again at Q Station. It was far too cold for our planned kayaking, stand-up paddle boarding and snorkeling but we consoled ourselves with a few good wines and a stunning dinner at the Boilerhouse Restaurant. Don't miss the history tour. You will get a lot more out of your stay at Q Station if you understand its history. Allow yourself enough time to explore the museum down near the wharf. I found the inscriptions carved by generations of residents in the soft sandstone outside the museum fascinating. Spend some time just wandering about. Q Station is a great place to explore. Have lunch or dinner, or both, at The Boilerhouse Restaurant. The food, under the direction of chef Matt Kemp, is superb. Note: David and I stayed as guests of Q Station. I thoroughly enjoyed reading this - so interesting. I think my grandfather's Aunt travelled to Australia in the late 1800's - i can't imagine just how hard the journey was. We are moving to Australia next year and i would love to visit Q Station Manly. I am signing up as i don't want to miss any posts in future. Hi Tracy, Thank you for the kind words. I hope your move to Australia works out. Feel free to send me an email if you want advice about Australia. You'll find my email address under the contact tab. I hadn't really taken that much notice of my family's history until David and I went to Q Station. I knew we had a family diary detailing the voyage out but I had never actually read it. Our visit to Q Station finally inspired me to read the diary and I am so glad I did. It was just fascinating. I have no relatives in England who I am in touch with. 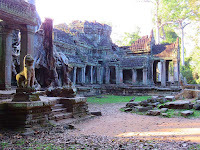 I am sure I have relatives there but our family lost contact with them a long time ago. However my son's partner is from Wales so he is renewing the family connection with Britain! This is very interesting. It must have added a further level of intrigue to know that your forebears had passed through this same area on their journey. It was just so interesting. I grew up in the same household as my grandmother and remember her talking sometimes about the sailing ship her mother came out to Australia on. It is a fascinating place. I would recommend a night or two there to anyone. When I read the family diary I was struck by how stoic they all were. They seemed to accept their fate in a way which we don't today. Thank you for sharing your family history. The actual words from Thomas' diary are a treasure indeed. It conjures up a very different picture of the usual tourist visit stuff about Sydney. Being from the U.S., Conrad and I have similar stories from relatives who came over from -- in both our cases -- from Scandinavia. So true, as you say, they accepted their fate in a way we don't today. Tough times. Tough people. America is known as a nation as immigrants but when people think of how Australia was populated they tend to think of convicts. In fact more Australians are descended from free settlers than from convicts. Some of the free settlers even came from the U.S. David has an ancestor who came migrated to Australia from America a few years before the ancestors I wrote about arrived. 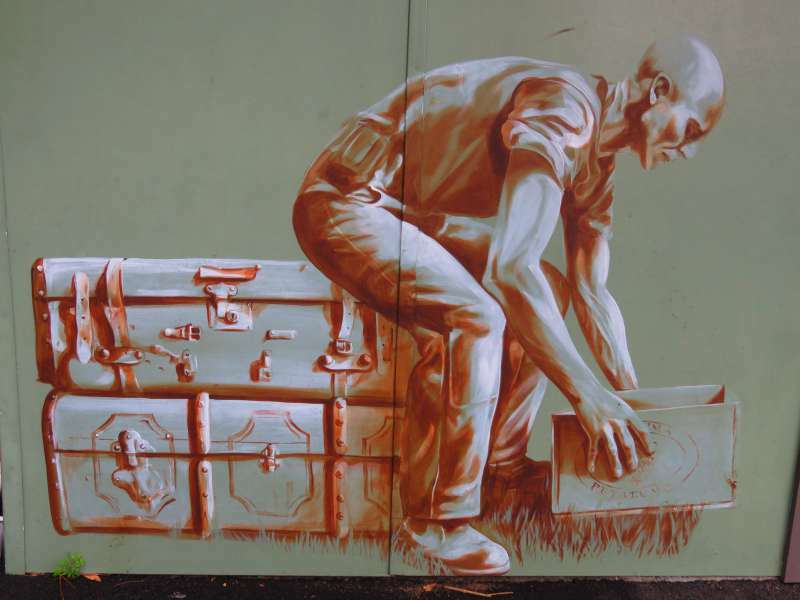 That is nice that you have been able to travel specifically to follow your ancestor's footsteps. They did not have the best circumstances and it is important to keep the stories around for the future. Visiting the Q Station made their history come alive for me. I confess that I wasn't much interested in them before that. Oh, Lyn. I don't think I'd like to do those stairs. Lovely photo of you, though. 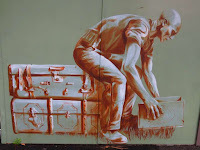 I would however, love to explore Sydney and all its wonders. Q Station is definitely a unique place in Sydney's history, and we enjoyed finding out all about it being a quarantine station when we were there. I remember your post about it. Q Station looks such an interesting historical place to visit. 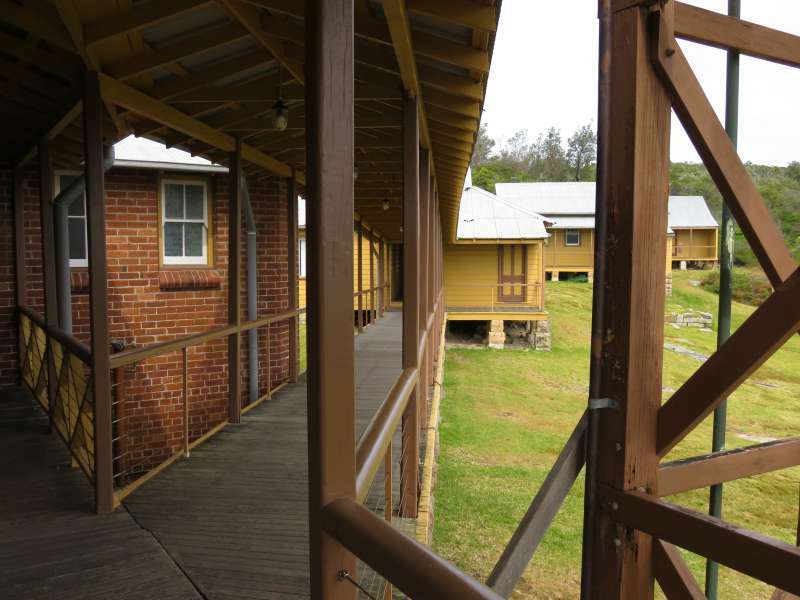 Being a quarantine station must have made it feel a little spooky, and a little macabre which adds to the appeal as a tourist destination. It is supposed to be the most haunted place in Sydney. A few weeks ago I wrote a post on my encounter with an apparition on their ghost tour. It was truly weird! I really like that this place continues to provide lodging -- although voluntary instead of mandatory. It's a wonderful way to acknowledge its history. That story about Christina is so sad. I imagine it must be quite difficult to bury your child at sea and not have a grave to visit. My grandmother used to tell the story of the child, who would have been her aunt, who was buried at sea so, yes I think it was very difficult for them. Ohhh, so sad that brief statement of little Christina, who lost her young life on the journey to Australia. We tent to forget how hard it must have been to travel in the 19th century. I only mentioned Christina because she was related to me but the diary mentions several other children who died on the way out - and quite a few who were born too. This is an interesting way to preserve history. You can understand the rationale for dealing with disease, etc. the way they did, given the means they had available at the time and how horrific an outbreak could bd. But they really did seem to run roughshod over peoples feelings, which seems very harsh to us now. At Ellis Island they would often change peoples names from complex ethnic ones to more simple "American" ones. it boggles my mind that the immigrants just went along with it, but I guess it's not a moment when you are going to be an upstart. I agree. Being an upstart would not have helped. In the days before modern medicine isolation was the only weapon the authorities had to combat epidemics. Reading my ancestor's diary, the impression I had was that he understood that. It was probably a bit like the way we have to subject ourselves today to so much security in order to board a plane. Nobody likes it but we accept the necessity for it in keeping us safe. How lucky you are to know so much about your family's history and have it documented in writing! Yes, very fortunate. The sad thing about family histories is so often we don't appreciate them until its too late to get the stories first hand. That was the case for me. I remember my grandmother talking about her mother's memories when I was a child and I wish I had taken more notice now. What an interesting story. It's great that you had a chance to explore family history, too! I had never heard of the Quarantine Stations, but it makes sense. A good reminder to be thankful for modern medicine and travel! Thanks for sharing your journey. Let us hope the world never needs places like this again. I thoroughly enjoyed reading this post. I love history and family history makes it that much more meaningful. It's so wonderful that you have your great great grandfather's (I think I got that right) diary. I kept trying to imagine what kind of long voyage they endured and it was so sad reading about Christina. It's amazing what our ancestors did to live in a new land. Great post! Yes, he was my great, great grandfather. It felt strange reading the diary of someone who was only 25 at the time and yet already had three children, one of whom would become my grandmother's mother. How great to have that diary and know your families history and to be able to check out Q Station where the Australian adventure started. My family came through NY's Ellis Island. I've been there and it was haunting but don't know how or when they arrived. I've tried searching shipping records with no luck. Maybe one day I'll be able to hire a genealogist. I went to Ellis Island many years ago. It is such an interesting place. We are lucky to have the family diary. Lyn what a fascinating post about your family history and Q Station. My heart breaks at the thought of one having one's daughter die from measles and then need to be buried at sea. Such hardships to those who were true adventurers. They came to Australia for a better life and I think they found it but they made some terrible sacrifices too.